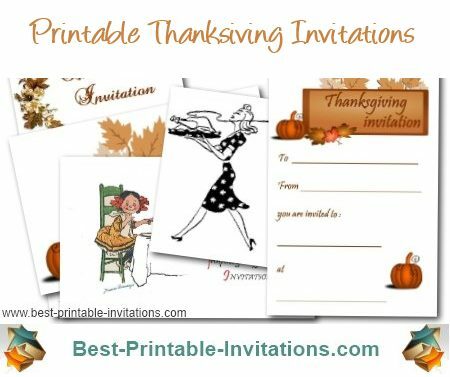 Need a Thanksgiving Dinner Invitation? Thanksgiving Day Dinner is a time for sharing. Why not invite your favorite people to come and eat with you? And here is just the invitation to use. This free printable invite is crisp and stylish. The invites fold into a card to give you lots of space to write your dinner details. Make sure you stock up on black ink if you need to print a lot of these cards. Mmm. Doesn't this invite make you imagine the smell of turkey cooking? This stylish black and white design is the perfect way to have your guests get an appetite in advance of the day. These invites print onto a single page and fold into a card. Don't forget to choose the correct paper size - either A4 or letter. 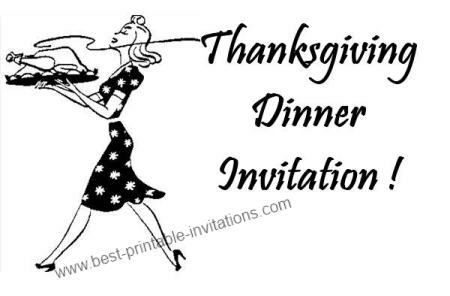 Printable Thanksgiving Day Dinner Invite. Remember to include all the details of your Thanksgiving dinner in the invite. Is it a pot luck? What time will it start and end? Will there be gifts exchanged? Once printed, take a little time to carefully fold your invite into a card - it makes a lot of difference to the final effect. The folded card should fit nicely into standard sized envelopes. Why not hand deliver for a personal touch?